Policy and Planning Fellow Edith summarises some highlights from the Digital Preservation Coalition’s briefing day on email preservation. See the full schedule of speakers on DPC’s website. Yesterday Sarah and I attended DPC’s briefing day on email preservation at the National Archives (UK) in Kew, London. We were keen to go and hear about latest findings from the Email Preservation Task Force as Sarah will be developing a course dedicated to email preservation for the DPOC teaching programme. An internal survey circulated to staff in Bodleian Libraries’ earlier this year showed a real appetite for learning about email preservation. It is an issue which evidently spans several areas of our organisation. As Kate Murray from the Library of Congress put it: “email is an object, several things and a verb”. In this sense email has much in common with the World Wide Web, as they are heavily linked and complex objects. Retention decisions must be made, not only about text content but also about email attachments and external web links. In addition, supporting features (such as instant messaging and calendars) are increasingly integrated into email services and potential candidates for capture. Thinking about email “as a verb” also highlights that it is a cultural and social practice. Capturing relationships and structures of communication is an additional layer to preserve. Anecdotally, some participants on the Email Preservation day had found that data mining, including the ability to undertake analysis across email archives, is increasingly in demand from historians using big data research techniques. 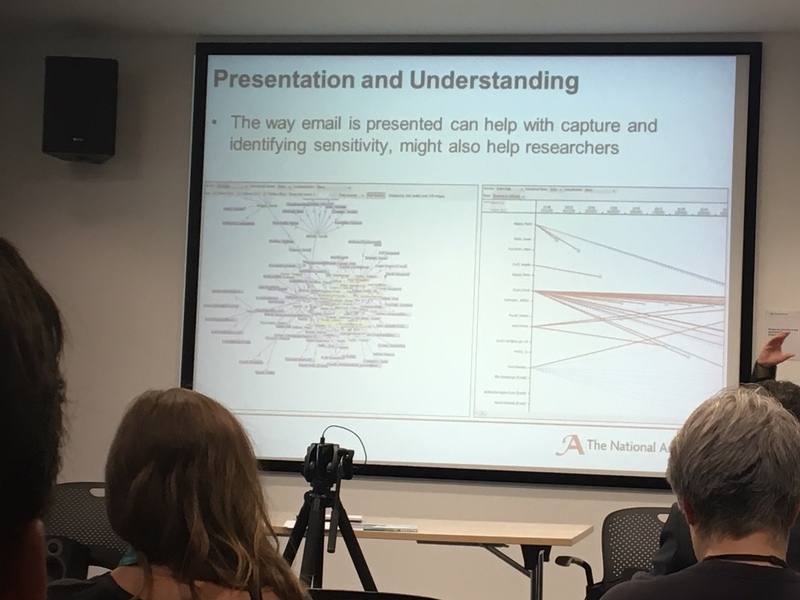 Anthea Seles, National Archives (UK), talks about visualisation of email archives. So what are organisations currently doing to preserve email? A strength of the Email Preservation Taskforce’s new draft report is that it draws together samples of workflows currently in use by other organisations (primarily US based). Additional speakers from Preservica, National Archives and the British Library supplemented these with some local examples from the UK throughout the day. While some archives choose to ingest Mbox and EML files into their repositories without further processing, others choose to unpack content within these files. Unpacking content provides a mode of displaying emails, as well as the ability to normalise content within them. The British Library for example have chosen to unpack email files using Aid4Mail, and are attempting to replicate the message hierarchy within a folder structure. Using Aid4Mail, they migrate text from email messages to PDF/A-2b which are displayed alongside folders containing any email attachments. PDF/A-2b can then be validated using vera/PDF or other tools. A CSV manifest is also generated and entered into relevant catalogues. Preservica’s out of the box workflow is very similar to the British Library’s, although they choose to migrate text content to HTML or UTF-8 encoded text files. Another tantalising example (which I can imagine will gain more traction in the future) came from one institution who has used Emulation As A Service to provide access to one of its collections of email. By using an emulation approach it is able to provide access to content within the original operating environment used by the donor of the email archive. This has particular strength in that email attachments, such as images and word processing files, can be viewed on contemporary software (providing licenses can be acquired for the software itself). What do we still need to explore? It is encouraging that people are already undertaking preservation of email and that there are workflows out there which other organisations can adopt. However, there are many questions and issues still to explore. As seen in many of the sample workflows from the Email Preservation Task Force report, email files are often migrated multiple times. Especially as ePADD works with Mbox, some organisations end up adding an additional migration step in order to use the tool before normalising to EML. There is currently very little available literature on the impact of migrations, and indeed multiple migrations, on the information content of emails. Support open source tools such as ePADD through either financial aid or (if you are technically savvy) your time. We rely heavily on these tools and need to work together to make them sustainable! Overall the Email Preservation day was very inspiring and informative, and I cannot wait to hear more from the Email Preservation Task Force. Were you also at the event and have some other highlights to add? Please comment below! This entry was posted in born-digital, digital lifecycle by ehalvarsson. Bookmark the permalink.